Preheat a grill pan on a high heat for 5 minutes until hot. Slice the pork into roughly 3/4 inch pieces. Wipe the mushrooms and cut the stalks off. Depending on the size of the mushroom either leave them whole or cut them into 3/4 inch pieces. Peel and cut your onion into eighths. Pull the rosemary leaves off the woody stalks. Zest 1 of the lemons and finely chop with the rosemary. Mix with the cumin, salt, and pepper. Scatter this over your clean work surface. Drizzle the meat, mushrooms, and onions with olive oil and roll them in the rosemary, lemon zest, and cumin. Skewer a piece of pork, followed by a piece of onion or mushroom, and repeat until all the pieces have been used. Do not pack the ingredients too tightly on the skewer. If you leave a little bit of space between each ingredient it will allow the steam and heat to better reach and cook the food. Drizzle the kabobs with oil and season well with salt and pepper. 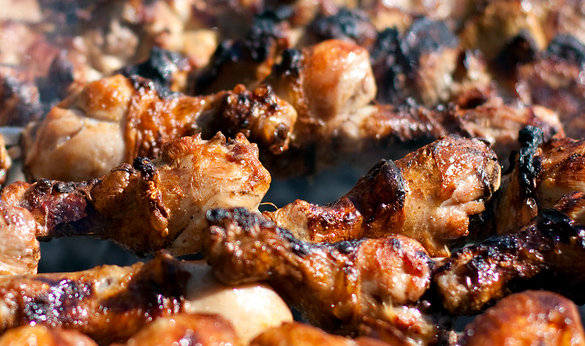 Put your kabobs on the hot grill and push them down gently. Cook for about 8 minutes in total, turning every 2 minutes so you cook every side, until everything is golden, slightly charred, and the pork is cooked through. Once the pork is done, give the kabobs a tiny drizzle of olive oil, a little more salt, a good squeeze of lemon juice, and a tiny drizzle of honey. Cook for another 30 seconds, turning as you go. To serve your kabobs simply place them on a plate and drizzle them with the juices from the pan. Serve with lemon wedges and anything from dips, salsas, sour cream to salad or rice.